Digestive enzymes are a popular (and logical) topic for those with gastroparesis, but there is hardly any helpful, reliable information to be found! It turns out that this is a multi-layered topic, so we’re finally going to settle in and sort out these products once and for all. Digestive Enzymes are used with the goal of supplementing the digestive function of the GI tract. It sounds like such a logical option for those with delayed emptying and reduced stomach movement. But (of course!) it’s not quite as simple as that. Knowing where and how digestive enzymes work is important to understanding if and when you should consider using them. Chemical digestion begins with the enzymes in the saliva, continues with the acid in the stomach, and really kicks into gear with the enzymes in the small intestine. The enzymes in the small intestine (supplied by the pancreas), break down all of our major nutrients, including proteins, fats, and carbohydrates. As I discuss in the GI Function article, the part of digestion that really goes missing in gastroparesis is mechanical digestion. That means that the grinding of the food that happens in the stomach is turned way down or doesn’t happen at all. This could also mean that the food is not as thoroughly mixed with the stomach acid, which might impact the acid’s ability to break down the food as effectively. In summary, MOST people with gastroparesis have normal chemical digestion – it’s our mechanical digestion that is off. This is important to know because digestive enzymes are intended to cause chemical digestion. And for many people with gastroparesis, they might not be as helpful as we first imagine. The term “digestive enzymes” refers to a smattering of different molecules that can break down certain parts of the foods that we eat. Each enzyme is particularly good at breaking down certain types of food. Some are good at breaking down proteins, some are good at breaking down fats, others are meant for sugars, and yet others are meant for fibers (and so on). These three enzymes can actually be found in prescription-grade medications (Viokase, Pancrease, Zenpep, etc). They are only prescribed for people who are not able to use the natural enzymes that come from the pancreas, such as those with chronic pancreatitis and those born with cystic fibrosis. Enzymes are molecules that react with other molecules. Each enzyme is shaped in just the right way to cause another molecule to break up into separate pieces – an enzymatic reaction. In the case of digestive enzymes, these reactions produce the small pieces of nutrients that are absorbed by the intestine. For our bodies to take in any of the nutrition in the foods that we eat, we must have enzymes in our GI tracts. And as long as a person has saliva and a functioning pancreas, those enzymes are present and active. But it’s important that those enzymes are in the right place at the right time. The digestive enzymes that the pancreas creates are only active in a basic environment (yep – back to high school chemistry with this one!). This means that when they are exposed to stomach acid, they disintegrate and become useless. But when they are in the basic environment in the small intestine, they are in their element and fully active. The medications that I spoke of earlier that contain protease, lipase, and amylase are made in very intricate formulas that protect the enzymes from the acids in the stomach. In fact, the enzymes are not even released from the product until they have reached the small intestine. If this precaution were not taken, the enzymes would be rendered useless in the stomach and the medication would not work at all. While a small number of enzymes can be effective in an acidic environment, the vast majority of enzymes do not handle acids well – the stomach would be their fatal kryptonite. This brings us to another important discussion point on the topic of digestive enzymes – how are they made and where do they come from? Most of these products are marketed as natural alternatives, which would indicate that they are not made in a lab, but rather come from nature. For some products, that is true. But there are still two places that natural enzymes can come from: plants and animals. Animals. There are some very real concerns with products that are made from animals. If a diseased animal part was used to obtain that enzyme, then the product could be contaminated with a disease that could be passed on to humans. While this risk is rare, it is real, and as such any animal products should be used with extreme caution. In addition, the quantity of the enzymes included in animal derived products are typically not well-controlled, so it is difficult to be certain of what you are buying/using. Plants. While plants may be a safer source of enzymes, their enzymes are different from those that are found in the body. The most common plant enzymes are bromelain (from pineapples) and papain (from papayas). The traditional use of these enzymes is actually as a meat tenderizer, and you’ll likely find one of those terms on any meat tenderizer powders that you buy at the grocery store. However, as we are about to discuss, those enzymes have not been studied well in humans. I won’t beat around the bush with this one. Much to my dismay, there are no studies that have looked at whether ANY over-the-counter digestive enzyme products are helpful for digesting foods. The only studies that currently exist are in the treatment of bezoars (and with those prescription products I mentioned that replace the enzymes from the pancreas). We’ll take a quick detour into the world of bezoars so that we can better understand how these situations do (or more commonly, do not) apply to typical food digestion. Bezoars are big globs of undigested materials (such as medications, foods, or other swallowed raw materials) that develop in the stomach. Fewer than 20% of people with gastroparesis will experience a bezoar in their lifetime, so don’t get too freaked out yet! Two enzymes have been studied for bezoars – cellulase and papain. They both appear to work relatively well to dissolve bezoars, but they are used in ENORMOUS doses compared to what you might take in a digestive enzyme. And those doses are not risk-free. In fact, a large number of people that have taken papain to eliminate a bezoar have also developed gastric ulcers and holes in the esophagus – the enzyme literally ate away the lining of the esophagus and stomach. Alright, back to enzymes and their ability to digest foods. The lack of studies that have been conducted is truly disappointing to me considering how many companies are currently selling digestive enzyme products. None of those companies have bothered to perform studies to see if they even work! This includes Digest Gold, one of the most commonly discussed digestive enzymes amongst people with gastroparesis. 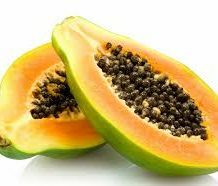 So not only do we not know if taking digestive enzymes provides any benefit at all, we also do not know which doses of plant enzymes (such as papain and bromelain) are actually active in the human GI tract. And to top it off, I have yet to find a digestive enzyme product on the shelf that protects its ingredients from the acid in the stomach. This means it is highly likely that most digestive enzyme products are actually rendered useless after they are swallowed, and never even have the opportunity to work on the foods that were eaten. It probably seems like I took the long way around to saying that these products are completely useless. But as always on this website, what I wanted to do was make sure that each reader understands the concepts behind the different treatment options. That way each of you can make your own decision on how to control your health. Because there are no studies out there that have even looked at whether or not digestive enzymes work, I can’t actually say whether they are beneficial or not. But we do have some information from which we can draw some informed conclusions. 4. None of the products that you find online, in the grocery store, or in the drug store have been studied. These companies have not done the legwork to show that their products work or are safe. That says something about the companies that sell these products – purchase at your own risk. Each person will need to consider how these points factor into their own situation. I am probably turning into a broken record, but please be cautious about the recommendations that you find online, and always do your research. Sometimes the reason that anyone considers taking Digestive Enzymes is simply to give the stomach a smaller work load. If you’re interested in learning more on how to do that by altering your diet, check out these articles on expanding your diet – with science! If you’re looking for more information on natural remedies, you can check out these articles on peppermint, iberogast, and nux vomica. Or if you just want to get a better understanding of gastroparesis, start here.